This entry was posted on Monday, April 26th, 2010 at 8:18 am and is filed under Uncategorized. You can follow any responses to this entry through the RSS 2.0 feed. You can skip to the end and leave a response. Pinging is currently not allowed. Taylor was not preferred to Joe Hart at City, it was simply that, having made the decision to let Hart go out on loan, we needed a number 2. Silly to let Hart sit on the bench as number 2, better for him to get further experience on loan. Stuart Taylor would’ve been good given the same chance as Flappy-handski and Pneumonia! Sometimes I despair of Arsene… he needs some new people around him… make David Seaman the goal keeping coach, Martin Keown the defensive coach .. some fresh blood is desparately needed at coaching level. Morning Kanz, my point exactly, same goes for Manninger.. But now we have two keepers who both pretty average who he stands by…. Taylor has been to Aston Villa too and never made the breakthrough and he has now gone to Man City as a backup keeper, no more. As far as im concerned it shows a lack of desire on his part. How can a keeper who was supposed to be so talented as a youngster be happy with spending his whole career on the bench. He should have dropped out of the Premier League, established himself then he would have got a move back if he was good enough. He has never played more than 10 games in a season, to me this points to the fact he isnt actually that good. 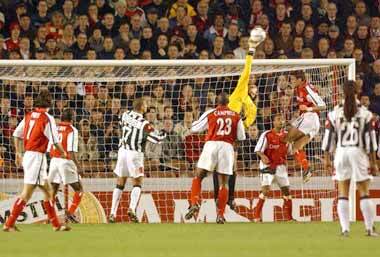 Manninger did play in the 98/99 season and was awful, shaky and having watched him for Juventus sometimes this season he still is, although a great shot stopper, he is crap at crosses and set pieces so he wouldnt solve our problem. Richard Wright was a talent but again look whats happened to him since Arsenal. I think all 3 had great attributes but I think mentally they werent equipped to be top class keepers. Morning kev, but isn’t that when a good coach is needed, not with wright he was overated just because he was english imho – just a thought? Morning.fab is on around 140k a week according to goal! Rvp says he wants to reach the ‘messi’ level but he has to stay fit first.good to know,now prove it! Arsène Wenger has hailed Manchester City keeper Stuart Taylor as a “big talent” but says the 29-year-old lacks top-flight experience. Taylor started his career at Arsenal before moving to Aston Villa in 2005. From there he moved to Manchester City last summer, where he has spent the season as Shay Given’s understudy. However, Taylor currently has a knee injury and is expected to miss the rest of the season, preventing him from deputising for Given, who dislocated his shoulder at Emirates Stadium on Saturday. After the match Wenger was asked about his former keeper and the manager’s response was full of praise. “He was a big talent here and I let him go because he wanted to play,” said the manager. “He is very tall, he is intelligent, he’s flexible for a tall boy and he has good reflexes for a tall boy. “His weaknesses are that he has not played a lot, you know, and he has not many games at the moment in the Premier League where the pressure is very high. I’m about KTR7, not for long though….